Similar to a bruise under the skin, a subconjunctival hemorrhage happens when a small blood vessel located between the sclera (white portion of an eye) and the conjunctiva (lining on the surface of an eye) breaks and covers the sclera with blood. Unlike broken blood vessels located under the skin which take on shades of black, blue, and green, a subconjunctival hemorrhage located under the clear conjunctiva has a bright red appearance initially, and slowly fades to orange and yellow, as the tissue of the eye absorbs the blood. Usually painless upon occurrence, a subconjunctival hemorrhage typically goes unnoticed until the individual looks in the mirror or someone else points out the red spot on the eye. Subconjunctival hemorrhage has few symptoms, and mostly affects a person's appearance and sometimes self-esteem. The hemorrhage, however, can cause a full sensation on the surface of the eye or a feeling of eye awareness when blinking. It can also cause slight irritation or a feeling of grittiness. Subconjunctival hemorrhage should not affect vision, cause pain, or lead to any changes in eye discharge. The specific cause of subconjunctival hemorrhage is not always apparent. Extremely delicate, the blood vessels of the eyes rupture easily and can break under the pressure of a powerful sneeze, violent coughing, vomiting, or strain from activities like weight lifting. 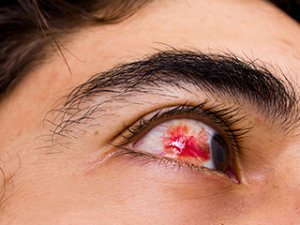 Subconjunctival hemorrhage can also result from an injury to the eye in cases of excessive eye rubbing, inserting contact lenses, or through some other trauma. In addition, a viral or bacterial infection of the eye such as conjunctivitis can cause a subconjunctival hemorrhage. Certain medications or medical conditions can predispose an individual to recurrent subconjunctival hemorrhages. These conditions include diabetes, high blood pressure or hypertension, blood clotting disorders, and blood thinning medications like aspirin or Coumadin. An eye care professional will diagnose subconjunctival hemorrhage by observation. If a trauma or injury to the eye is pinpointed as the cause of the subconjunctival hemorrhage, a more comprehensive eye exam will be necessary to check for further damage. Like bruises on the skin, subconjunctival hemorrhages clear up on their own without additional treatment. The blood will eventually absorb back into the eye and disappear. If caused by an infection or underlying medical condition, treatment for that underlying medical problem will be necessary.